Aquaman didn’t make it on the shortlist to win an Oscar for its visual effects, and the people behind it aren’t pleased. Released on the 21st December 2018, Aquaman has quickly become DC’s highest-grossing movie of all time, is set to top 1 Billion worldwide at the box office and is the most financially successful movie of the DC Extended Universe yet. Needless to say, the majority of Aquaman needed to be set underwater which certainly made the prospect of bringing Aquaman to the big screen even more challenging. Whilst other films have used techniques such as filming under water, working with divers, underwater camera crews and grueling experiences for the actors when holding their breath or challenging the cold of the water, there is no way that such techniques could be sustained for an entire film. The amount of time actually spent filming versus the adverse health effects it would bring for the entire crew, actors and stunt doubles, not to mention the impossibility of trying to capture superhero stunts and speaking literally underwater is obviously impossible in real-life. Therefore Aquaman instead relies on extensive VFX and CGI in order to make it seem like the characters are actually underwater. The movie uses constant wirework to make it seem like the actors are floating right down to small gestures or tiny movements. James Wan was adamant that the water-element of Aquaman appear as real as possible. 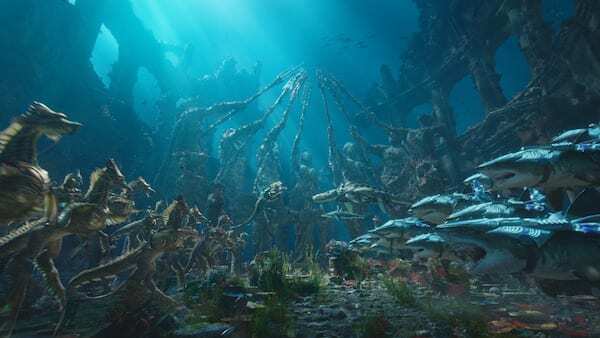 Inevitably, if the audience had failed to accept that Aquaman and co were underwater or if the believability wasn’t there then the movie wouldn’t have succeeded as it had. In order to add the water, superhero effects and not to mention the state-of-the-art huge sunken city that is Atlantis, the VFX used had to be extremely cutting edge and push the technology to its limits. The amount of work inputted into the movie, the artistry involved and the believability of imagined worlds coming so colorfully to life deserves huge recognition. One of the reasons Aquaman was such a huge success is the film bought elements of the comic books to life. The scenes recreated through VFX are almost exact copies of covers and scenarios from the comic books right down to smaller details like our glimpses at the sea-turned. It also had the right amount of emotional connection and was relatable to audiences whilst still feeling new, exciting and mystical through its fantastic visuals and wonderful escapism. Its no wonder then, that James Wan has publicly stated his dismay at Aquaman being removed from the Oscars VFX Shortlist. The Oscars have notoriously preferred to focus on more independent and less mainstream films, with superhero movies being mostly excluded from these prestigious awards. Let us know your thoughts in the comments. Do you think Aquaman should be nominated?